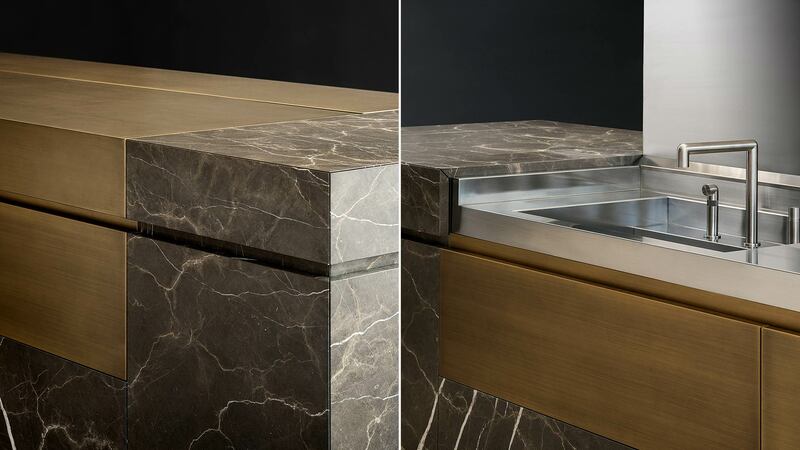 Neolite is the evolution of TM Italia’s Petra concept characterized by the use of natural stone. 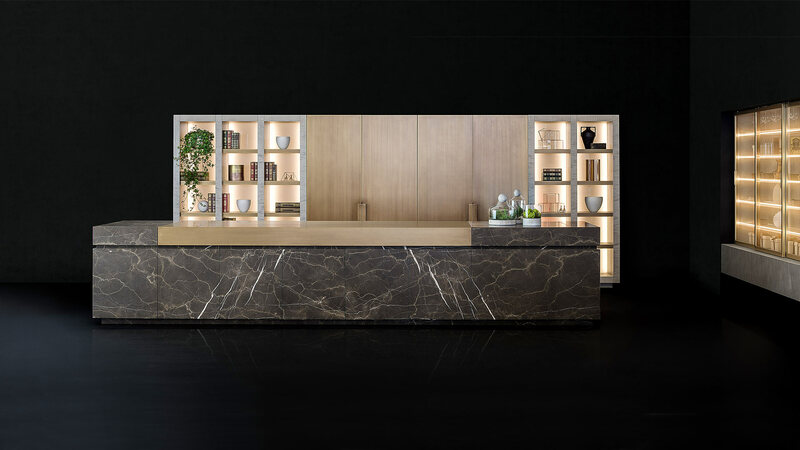 Thanks to seamlessly applied slats of Brown Gold natural stone, the large work island at the centre of the kitchen acts like a big monolith dominating the space. A large antique bronze insert encircles the upper part of the island like the precious buckle of a treasure chest. 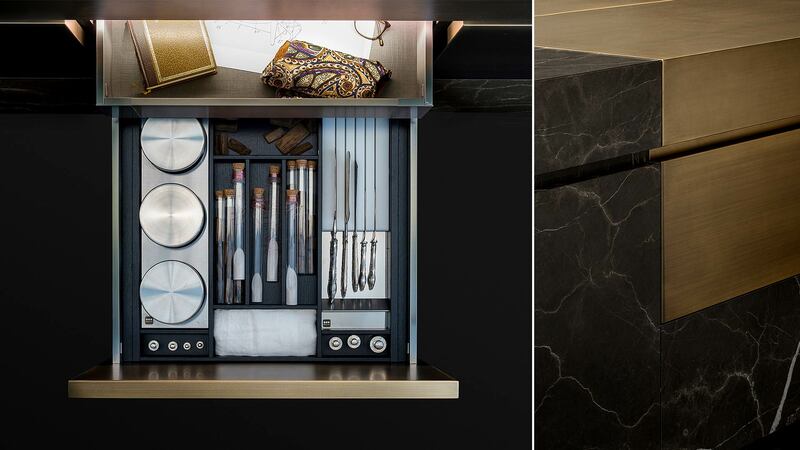 It conceals the sink, hob and extractor hood. The oven is vertically extractable. The tall composition consists of two parts: one closed, with four columns and retractable doors with an antique bronze finish. 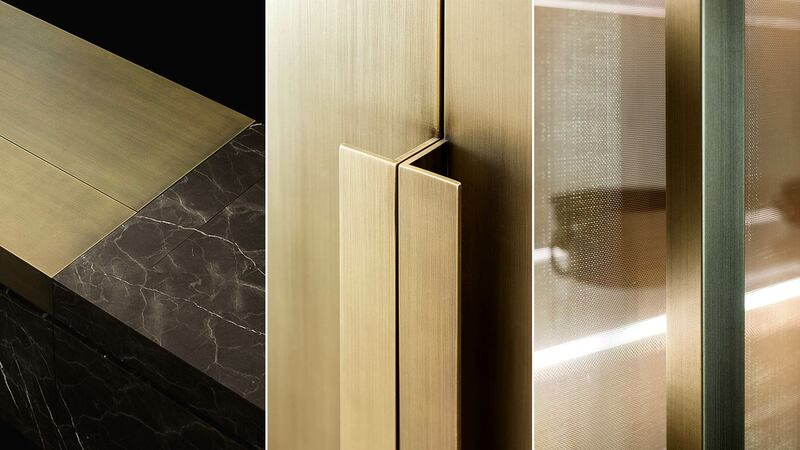 These columns house ultra-modern kitchen appliances and offer ample space for food and cookware. 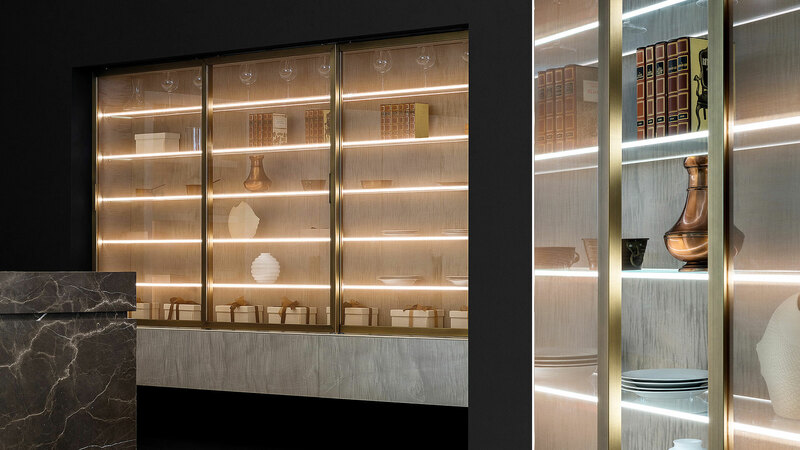 The open part of the composition has five columns and features side walls in sycamore wood, antique bronze shelves and a back wall made from laminated glass with a backlit bronze fabric insert. A suspended display cabinet completes the composition with sliding glass doors and an antique bronze frame, glass shelves and sycamore wood structure. 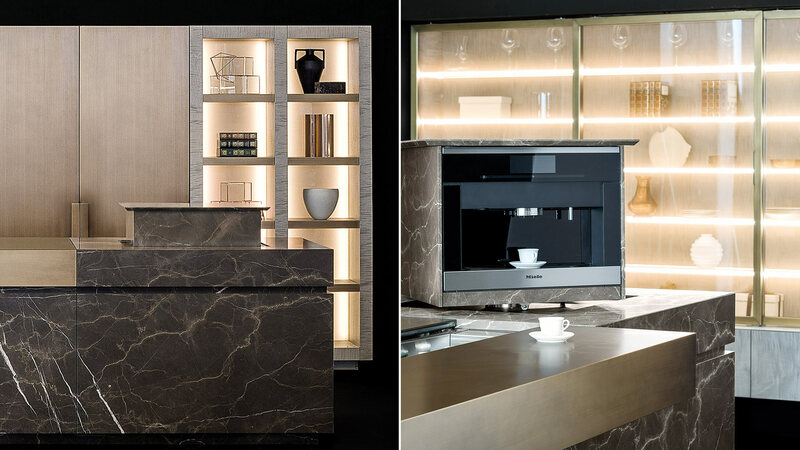 The Neolite kitchen creates a perfect link to the living area. 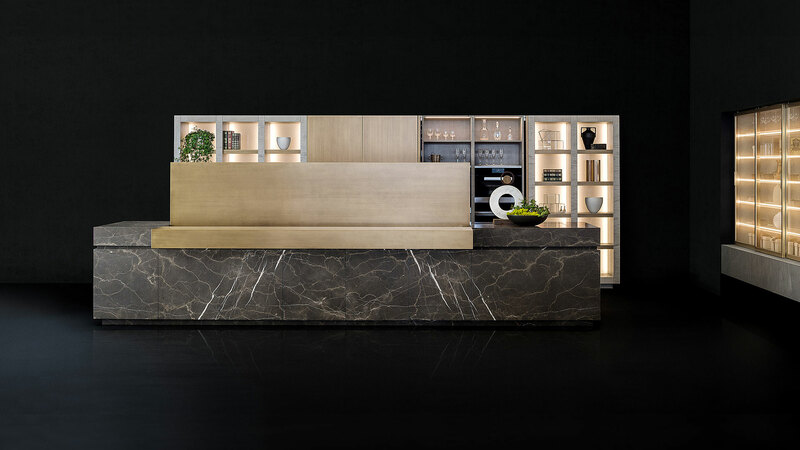 It provides a convivial space built into the work island, boasting premium finishes and incorporating stylistic elements that recall typical characteristics of the living room furniture. Brown Gold stone, bronze metal components, sycamore wood, laminated glass with backlit bronze fabric insert. Island interiors in Maya Bronze finish. Tall Unit: L 560 cm x D 70 cm, H 216 cm. Island: L 485 cm, D 120 cm, H 94 cm. Display cabinet: L 300 cm x D 50 cm x H 220 cm. Tall cabinets: pantry cupboards with automatic LED lighting, Miele oven, Miele warming drawer, Miele wine cooler. Island: Miele cook top with extractable hood, sink in welded stainless steel, compartments and drawers, drawer for sorting waste, drawers with sponge holder and cutlery tray. Creative studio: architecture and design.